The earliest daffodils are blooming right now. 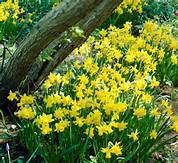 The very miniature ones you see in tidy little clumps are probably “Tete a’Tete”. If you didn’t buy and plant these little bulbs in fall, you can still get some of them as potted plants. They’re sold in most nurseries and many grocery stores. They’re usually in bud or bloom. Enjoy them in bloom and keep the green part alive as long as you can. Then plant the bulbs directly into the garden. The small daffodils that bloom a little later and are just a little taller than the minis are probably “February Gold”, another one you can easily find already growing in pots. Just because you forgot to (or didn’t want to) get out in cold October and plant bulbs, doesn’t mean you can’t enjoy a few. Keep in mind, squirrels and deer don’t like the taste of daffodils…another bonus! The easiest way to keep your tools in good shape is to: clean and dry them, sharpen them and plunge the blade ends into a five gallon bucket filled with a bag of play sand mixed with a couple of bottles of mineral oil. Do this with pruners, trowels, garden knives, grass shears and any tools that might rust. You can even make this your permanent “tool home”. You’ll always know where they are and they’ll always be in good working order. Just-for-fun gardening websites are just as valuable as “how-to” websites, especially now when going outside in the garden looks a little “iffy” to say the least.